Synchro Slide is a unique 3D sliding puzzle game that really puts your puzzle solving skills to the test. It has remarkably simple controls, as you just have to slide in 4 directions, but a very challenging gameplay. You control 2 (or more) sliders at once, and you must move them onto the designated spots. The challenging part is having to calculate your moves as a group rather than for individual sliders. You’ll have to use your intuition to solve each puzzle in less (or equal) moves to the specified target. Challenge your friends and see who stands higher in the worldwide leaderboards. Sliding puzzle gameplay. The goal in Synchro Slide is to move 2 or more sliders into the marked spots. 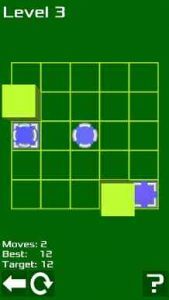 The catch is that sliders move in sync, thus you must use existing fixed blocks to create gaps between sliders and solve the puzzle. Multiple levels. Synchro Slide has 60 different puzzles, each more difficult than the previous one. For every level there’s a Target Moves goal and you have to aim to solve each puzzle in less moves to get a star. You also have to move sliders onto goals that match their color. Hints. If you’re stuck you can use hints to solve a difficult puzzle. A sequence of moves will be shown and you can follow those to find the solution for each puzzle. Leaderboards & Achievements. Connect with Google Play Services to unlock the worldwide leaderboards and see how you stand against other players. Unlock achievements to prove you’re mastering the game.